Get Well Balloon - Gifts - Balloons - Perth Florist Perth in Western Australia specializing in flower delivery of roses and wild flowers. 45cm foil Helium filled balloons are available ONLY as an accompaniment to floral or gift deliveries. 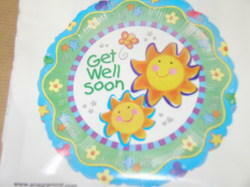 There are many designs to the Get Well range - from humorous to bright or soft. Also childrens or adult designs. You may enter your preference in the special info section of the order form.